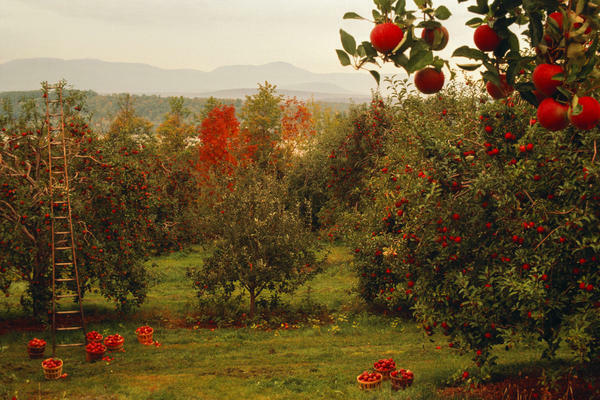 New technologies and a changing climate are altering the way apples are grown in places like New York's Hudson Valley and across the country. 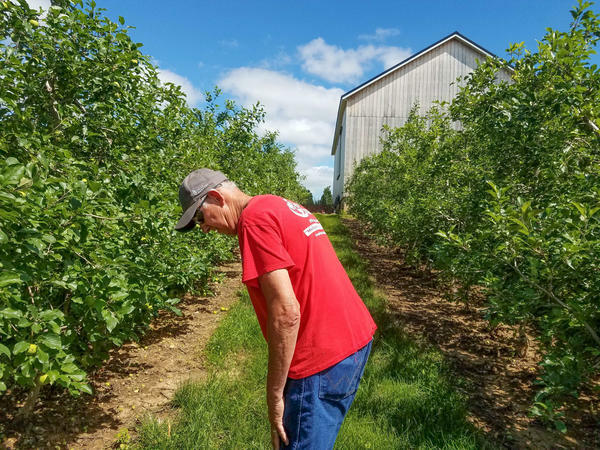 Fourth-generation apple grower Phil Schwallier walks down densely planted rows of apple trees in his orchard in Sparta, Mich.
Modern apple orchards have trees planted in tight rows on dwarfing rootstocks, which produce high-quality apples more efficiently. Honeycrisp apples in Schwallier's orchard have been sprayed with calcium carbonate, a white substance that protects the apples from sunburn. "This one's got a little sunburn on it," he says in early July. "A red yellowish color developing here on the part that's facing the sun. That's just from Friday, Saturday, Sunday, when it was so hot." The warming climate is an increasing problem for agriculture. As weather disasters like heat waves and floods become more frequent and severe, crops are at risk of damage. But even in a good year, slowly rising temperatures make growing the food we eat more difficult. For instance, too much heat can mess with an apple's color. If nights don't cool down enough for their pigment to fix in place, an apple that is supposed to turn red won't — ending up a murky pinkish-brown instead. 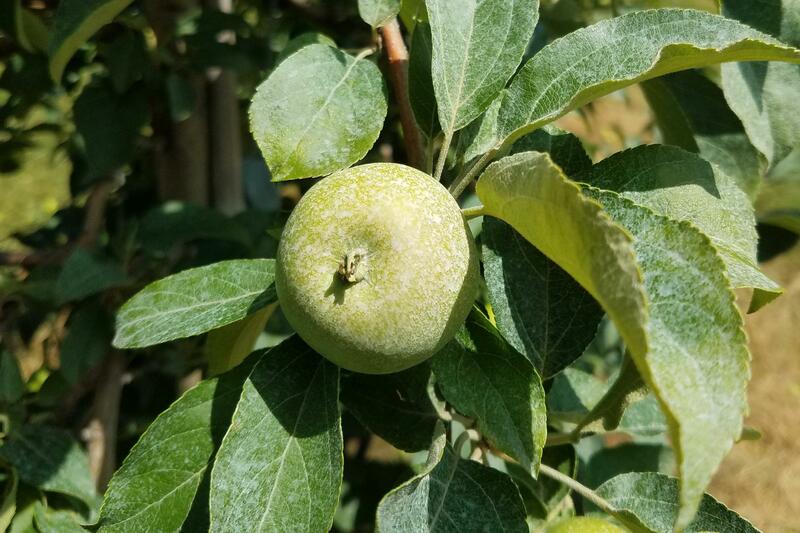 Then there is frost risk: If the temperature drops after the apples have started growing, they can develop a cosmetic defect called russeting — rusty brown splotches on the skin. Schwallier turns an apple in his hands, showing how the russet can be just on part of the apple, or stretch all around it: "They eat just fine, but we throw them in the juice because they've got this defect." Turns out apple growing is a ruthless business obsessed with good looks. If an apple has any sort of blemish, it won't make it to the shiny pyramid in your grocery store. Instead it's fated to be juice or applesauce — for which growers get just a fraction of what they would be paid for a fresh apple. 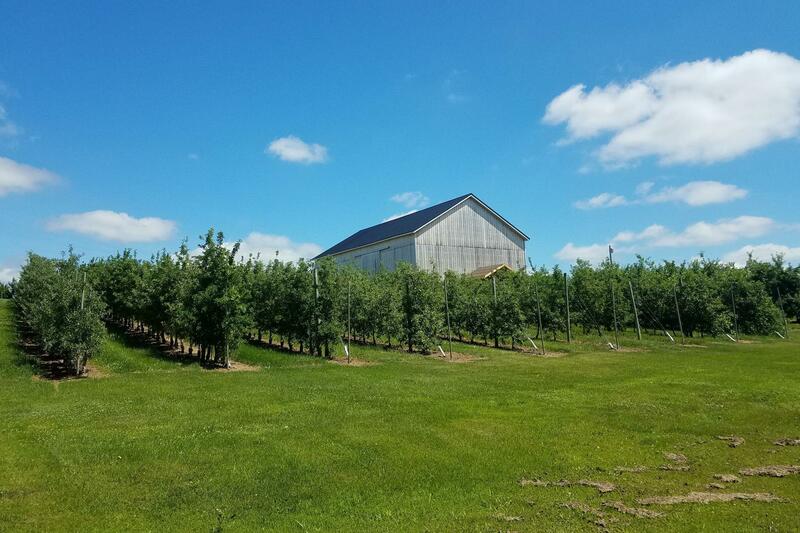 This area north of Grand Rapids is known as The Ridge, and it's a hotbed for apple growing. Schwallier grew up on a fruit farm in the area, and he has been growing apples himself since 1979. "We've been having milder winters and hotter summers," he says. "More extremes, more variation up and down." And he says he has seen more defects in the fruit as the climate has warmed. For 150 years, western Michigan has been the perfect place to grow apples, says Jeff Andresen, professor at Michigan State University and the state climatologist. One reason is that Lake Michigan, to the west, moderates the climate here. But Andresen says that in recent decades, higher winter temperatures have led to a decrease in the ice cover on the Great Lakes. And less ice means that spring comes sooner. That's what happened in 2012. "That year we had an unprecedented heat wave during the month of March — by far the warmest March on record," says Andresen. "We went essentially directly from winter to summer." In April and May that year, the weather returned to normal, which means plenty of occasions of subfreezing temperatures. The result was devastating to the state's fruit crops. "In most of our production areas, there was little or no crop at all," Andresen remembers. He says the data isn't yet clear on whether earlier spring means a greater frost risk for growers, but it is a concern. An earlier spring raises other worries, too — like more pests, diseases and weeds. Take the codling moth, known destroyer of apples. "If we have a warmer climate," Andresen says, "maybe we have to deal with three generations of that pest in a growing season. Historically, we've typically only had to deal with two." That means that many growers will spray a third round of pesticide, closer to when the apples are harvested. And it's not just apple crops that are affected by climate change. Higher temperatures are reshaping the entire agricultural landscape, drawing a new map of what can grow where. "Michigan used to produce more dry beans, navy beans, kidney beans, black beans, things like that — than any other state in the union," says Jim Byrum, president of the Michigan Agri-Business Association. "We're seeing that industry move west and north — North Dakota, Minnesota, even Saskatchewan, which is far more north than the state of Michigan," he says. "And that's because of climate change. Some of the biggest production increases in corn acres, for example, the last few years have been in states like North Dakota where corn has moved in. When historically, they didn't produce corn." So for some farmers, the warming climate means a longer growing season and new crops to plant. But for most, it just means more unpredictability. Sometimes it's too hot, sometimes too cold. There can drought or punishing rains. That variability creates more risks that growers must protect against — and that's expensive, says Gregory Peck, an assistant professor of horticulture at Cornell University. "Not only do you need to invest in irrigation to be able to survive through those years of drought, but you're also going to need to install more drainage lines for those years when we have excessive rainfall." Back in Sparta, Schwallier's Country Basket has all the latest technology to protect against weather's extremes: irrigation for dry spells, nets to protect against hail and wind, and tall fans that can blow warmer air toward the ground on cold nights when it could frost. "When we plant an orchard, it's such a major investment that we're going to be living with that orchard for like 10 or 20 years before we take it out," Schwallier says. "So we have to be careful on what we plant, and what we choose." And on a hot sunny July day, workers on the farm are protecting that investment, by spraying the Honeycrisps with calcium carbonate: sunscreen for apples. The warming climate is an increasing problem for agriculture. Even in a good year, one without lots of heat waves or floods, slowly rising temperatures are making it harder to grow food. As part of our summer series on heat, NPR's Laurel Wamsley looks at its impact on apples. LAUREL WAMSLEY, BYLINE: Harvest time is months away in Sparta, Mich. But walking through his orchard, fourth-generation grower Phil Schwallier can already tell which apples he won't be able to sell. PHIL SCHWALLIER: Got a little sunburn on it. WAMSLEY: That's right. Apples can get sunburned. SCHWALLIER: Yellowish color developing here on the part that's facing the sun. That's just from Friday, Saturday and Sunday when it was so hot. WAMSLEY: Too much heat can also mess with an apple's color. If nights don't cool down enough for their pigment to fix in place, apples won't turn that nice shade of red that consumers like. And then there can be damage when apples start growing only to be hit by frost. SCHWALLIER: This is Russet that's growing down the side of the fruit, and this is a defect. I have to throw it out. JEFF ANDRESEN: What you can see in general is less ice for less time on the lakes than used to be the case in past decades. WAMSLEY: And less ice means that spring comes sooner. That affects the growth patterns of not just crops but also the insects that can destroy them. ANDRESEN: If we have a warmer climate, they're going to develop faster than they have in the past. An insect pest like codling moth - maybe we have to deal with three generations of that pest in a growing season. Historically, we've typically only had to deal with two. WAMSLEY: Which means that many growers will spray a third round of pesticide closer to when the apples are harvested. It's not just apples that are affected by all of this. Higher temperatures are reshaping the entire agricultural landscape, drawing a new map of what can grow where. Jim Byrum heads the Michigan Agri-Business Association. JIM BYRUM: Michigan used to produce more dry beans - navy beans, kidney beans, black beans, things like that - than any other state in the union. We're seeing that industry move west and north. And that's because of climate change. Some of the biggest production increases in corn acres, for example, the last few years have been in states like North Dakota when historically they didn't produce corn. WAMSLEY: So for some farmers, the warming climate means a longer growing season and new crops. But for most, it just means more unpredictability. Sometimes it's too hot. Sometimes it's too cold. There can be drought or huge rains. All of that creates more risks that growers must protect against. And that's expensive, says Gregory Peck, a professor of horticulture at Cornell University. GREGORY PECK: Not only do you need to invest in irrigation to be able to survive through those years of drought, but you're also going to need to install more drainage lines for those years when we have excessive rainfall. WAMSLEY: Apple grower Phil Schwallier has all the latest technology to protect against weather's extremes - irrigation for dry spells, nets to protect against hail and wind, and tall fans that can blow warmer air toward the ground on cold nights when it could frost. SCHWALLIER: When we plant an orchard, it's such a major investment that we're going to be living with that orchard for, like, 10 or 20 years before we take it out. So we have to be careful on what we plant, what we choose. WAMSLEY: And on this hot, sunny day, workers on his farm are protecting that investment, spraying his Honeycrisps with calcium carbonate. It's sunscreen for apples. Laurel Wamsley, NPR News, Sparta, Mich.
(SOUNDBITE OF BILL FRISELL'S "DISFARMER THEME") Transcript provided by NPR, Copyright NPR.